More than qualified: Penn State announced yesterday that Amr Salah Elnashai will serve as the new dean in the College of Engineering. Elnashai is currently head of the Department of Civil and Environmental Engineering at the University of Illinois at Urbana-Champaign, where his list of accomplishments is impressive. “The breadth of his expertise and international reputation will further Penn State’s position at the forefront of engineering education,” said President Rodney Erickson. Elnashai will begin his tenure on Jan. 13. Good sports: Head trauma in professional sports has been big news lately, and Sports Illustrated is devoting two weeks to the topic on their NFL-specific blog, MMQB. You might recognize the names of two writers who contributed to the special report: We told you about sportswriter Jenny Vrentas ’06 this summer, when she scored the gig with SI; in her piece, she explores the latest in helmet technology. And Emily Kaplan ’13, a fantastic writer who also happens to be a former Penn Stater intern, covers how head injuries have impacted one Georgia high-school team. Way to go, Jenny and Emily. Raising the roof: The big news around here yesterday afternoon: the announcement of the senior class gift. The HUB Green Roof Terrace is described as an “open-air terrace,” which will provide additional seating and a scenic view of Mt. Nittany atop the HUB-Robeson Center. The roof will offer some environmentally friendly benefits, as well. Check out our intern Maggie McGlinchy’s post for more info. Snow no: After growing up in upstate New York, I’m no stranger to snow in October (or any other month, really). But coming off the past week of unseasonably warm temperatures around here, seeing even a tiny bit of the white stuff is jarring. 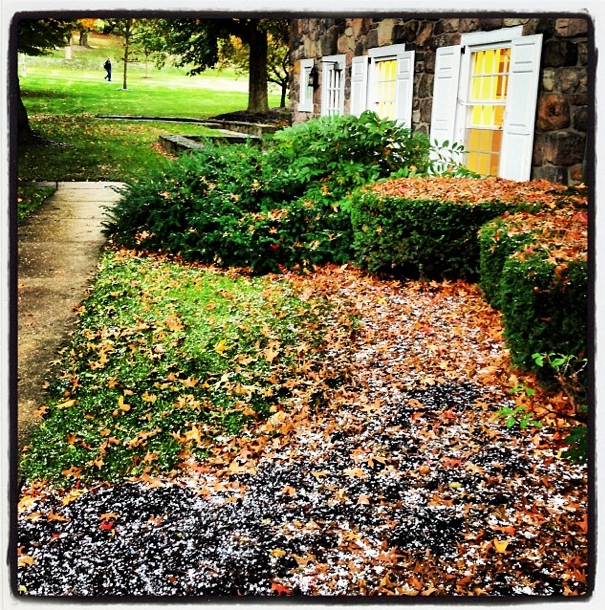 Snow hasn’t hit State College yet, but Penn State Behrend students woke up to light dusting this morning, as evidenced by this photo, from the @psbehrend Instagram account. Something tells me we ain’t seen nothin’ yet. Entry filed under: Uncategorized. Tags: Amr Salah Elnashai, Emily Kaplan, Jenny Vrentas.